Photo courtesy of Last Mountain Distillery. Every distiller these days is infusing this and that into various cocktails – and one of the most unique is Last Mountain, which adds dill, cucumbers, and jalapenos to their vodka. They could have infused pickles, but they didn't want to make a briny spirit. An odd combination (indeed) – and if you taste it straight, it is just what you might expect – alcoholic, spicy dill pickle. However, context is needed – it is purpose build essentially for a single cocktail, the Caesar cocktail – developed in Calgary and still primarily consumed in Canada. It was invented in 1969 by Walter Chell to celebrate the opening of a new Italian restaurant, made by combining tomato and clam juice with vodka. It is an incredible cocktail, often so crammed with garnishes that you have to dig out the actual cocktail! This is no coincidence – the cocktail pairs so well with so many different garnishes (a spicy rim, celery, olives, pickles, black pepper, lime). It is a garnish party. I like full flavored, spicy caesars: I use 3 oz clamato, 1.5 oz dill pickle vodka, 3 dashes worchestershire sauce, 10 dashes Frank’s red hot (I love spicy!) – over lots of ice, with a rim of garlic powder, onion powder, salt, and pepper. I garnish with freshly ground black pepper, a celery stalk (trim to size and let sit in water for 20 mins to crisp up beforehand). I garnish with as many of the following as I have on hand: dill pickles, olives, lime, dill. Celery is a must, and is one of the absolute best cocktail/garnish pairings. It’s great – almost more of a cocktail meal than a cocktail. It’s perfect for weekend late mornings. It is different – vegetal and savory rather than the typical fruity and citrusy or spicy and earthy cocktails. The clam adds some lovely seaside mineral notes, too. But, now to Last Mountain – in Saskatchewan a lot of people will add dill pickle juice to their caesars, and Last Mountain decided to circumvent this step. 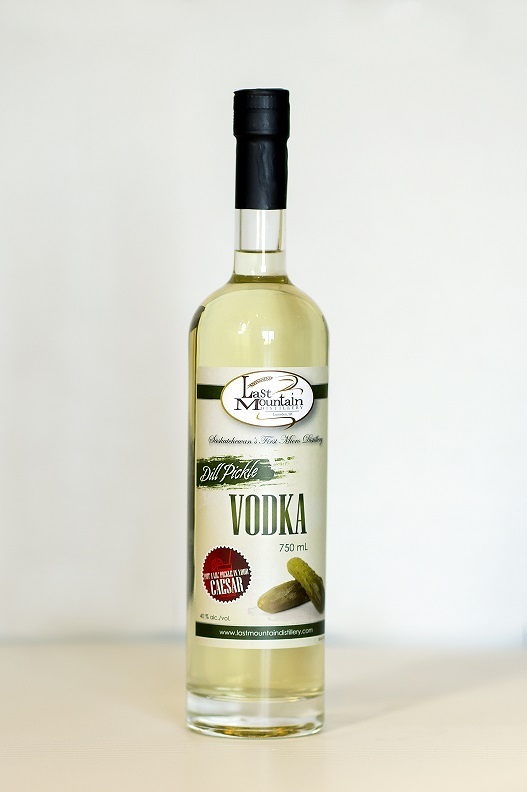 I’d heard of this dill pickle vodka (the best selling saskatchewan made spirit), and I resisted writing about it until I have actually tried it – now I have, and must recommend it.